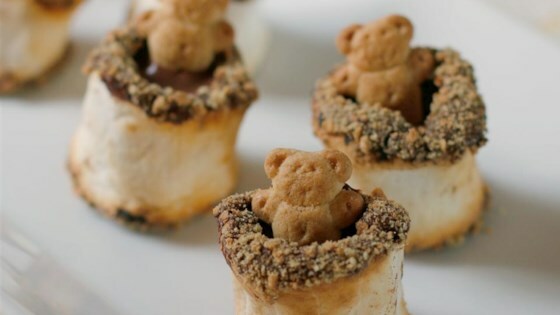 "Mini teddy bears chill out in toasted marshmallow hot tubs filled with super-easy chocolate bourbon ganache and edged in graham cracker crumbs. If these sassy s'mores don't own your party, you're not having enough fun." Insert a fork into 1 end of a marshmallow without pushing it through all the way. Toast over a gas or electric burner set to medium-low, rotating until all sides are browned and marshmallow is puffed, about 1 minute per side. Hold the marshmallow high enough so the heat causes the marshmallow to puff up without catching on fire. Don't brown the top end where the fork is inserted. Whisk the cooled ganache until fluffy; pipe into each marshmallow using a pastry bag or plastic bag with a corner cut off. Garnish each "hot tub" with a teddy bear-shaped graham snack. Seriously adorable adult dessert bites with marshmallows, bourbon, and chocolate. Flavoring the ganache with bourbon is optional. You can use any other liqueur, or leave out the alcohol altogether for a kid-friendly version. A co-worker of mine made these and brought them in to share with everybody and they were awesome. Super tasty and pretty cool looking. I hope she gets a giant raise. I only ate one, but I wish I had about 20. These were so decadent, rich, and wonderful. So worth the effort to create these little masterpieces. Loved it! Such a great idea and tastes delicious too.